Okinawa, surrounded by the Pacific Ocean on one side and the East China Sea on the other, is an ideal place for marine science research. In an inauguration ceremony held on Wednesday, July 13, 2016, Okinawa Institute of Science and Technology Graduate University (OIST) opened a marine science laboratory that will work to advance marine research, in an optimal location by the sea. The marine science laboratory named “OIST Marine Science Station” is designed to offer an experimental site for OIST scientists and others in Japan and abroad to carry out their research projects in the field of marine science. The inauguration ceremony began with four speeches from key players in the development of the OIST Marine Science Station: OIST President Jonathan Dorfan, Onna Village Mayor Yoshimi Nagahama, Louis Legendre, a member of the International Advisory Board, and Prof. Nori Satoh of OIST’s Marine Genomics Unit. This was followed by a traditional Okinawan dance performed by OIST staff called Tanchame that depicts the historic connection between the people of this area of Okinawa and the sea. The Tanchame dance expresses the vivid daily life of young fishermen catching fish in the sea near Tancha Village, the village just below OIST main campus. Then the dance shows young women from the village going to sell the fish in town. 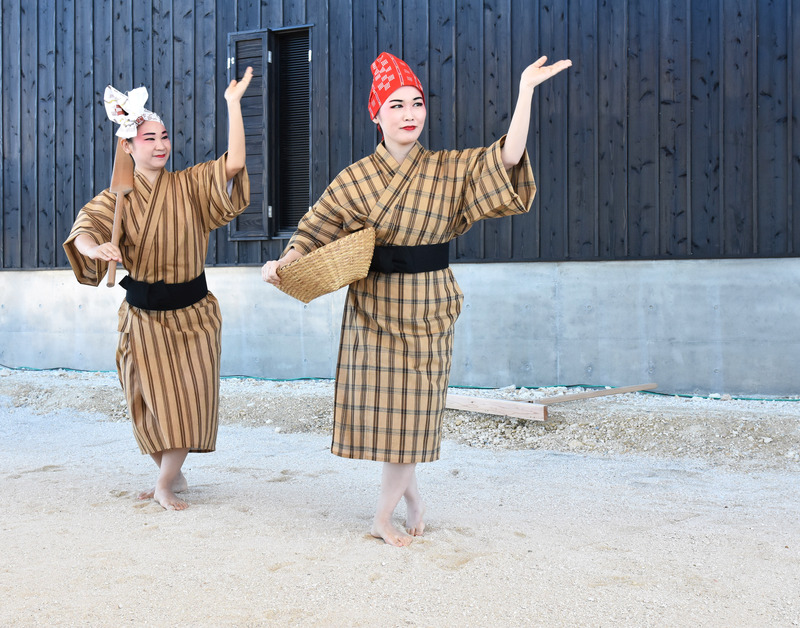 This dance to at the opening of the OIST Marine Science Station depicts the historic connection between the people of this area of Okinawa and the sea. The OIST Marine Science Station is located in the Seragaki Port in Onna Village, approximately eight kilometres northeast of the main campus in Tancha, Onna. The facility is equipped with 80 water tank systems and a 3-meter deep pool. The OIST Marine Science Station aims to become a hub of multi-faceted marine science research and experiments. Mayor Nagahama added that the opening of this facility may be a chance to collaborate with the local people. 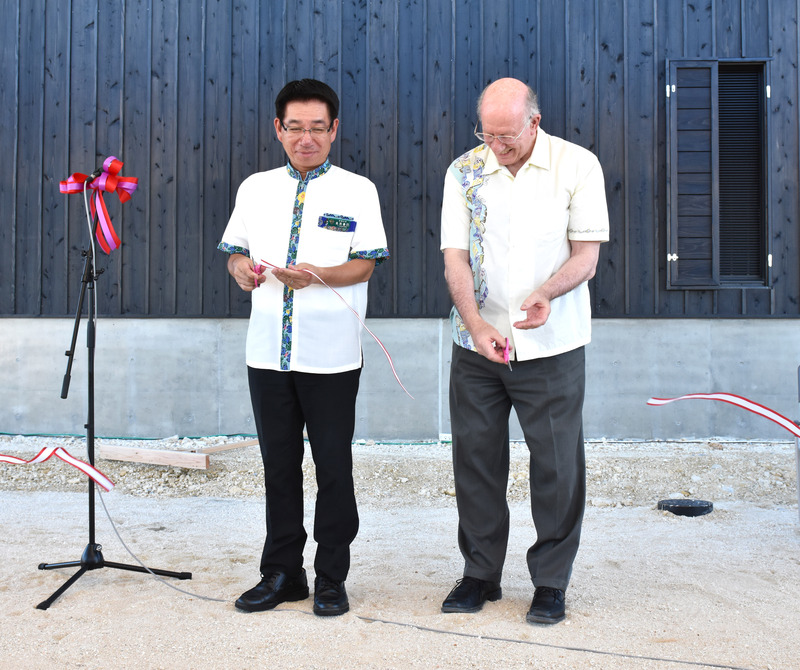 Onna Village Mayor Yoshimi Nagahama and OIST President Jonathan Dorfan cut the ribbon that symbolizes the opening of the OIST Marine Science Station. The OIST Marine Science Station will have no boundaries in its facility use, adhering to one of OIST’s main principles, promoting interdisciplinary research. For example, OIST Marine Genomics Unit led by Professor Noriyuki Satoh, which chiefly focuses on decoding the genome marine animals and plants to understand their origins and evolutionary paths. They will collect samples of corals, crown-of-thorns starfish (Acanthaster planci), acorn worms (Hemichordata), gobies, and other vertebrate animals inhabiting the waters off the coast of Okinawa and will cultivate the region’s distinctive algae, such as Mozuku seaweed and Umi budo (sea grape), to use them for future experiments. The OIST Quantum Wave Microscopy Unit led by Professor Tsumoru Shintake, will make the new facility into a technological development center for OIST’s unique project of developing wave-power generation. The facility will also serve as a site for the Marine Biophysics Unit led by Satoshi Mitarai to conduct studies to understand the effects of surrounding ocean currents on corals, which could highlight a potential cause of coral bleaching. “It is difficult to investigate the correlation between the events occurring that have been observed under the sea. However, we can now expand our current small lab-based studies and start doing experiments using sea-water at relatively larger scale,” Mitarai said. OIST musicians and dancers who performed the traditional Tanchame dance with OIST executives with Louis Legendre (back row, second from the right) a member of the International Advisory Board. Ali Gangehlou and guests touring the inside of the OIST Marine Science Station. President Dorfan giving his opening speech at the OIST Marine Science Station inauguration ceremony.